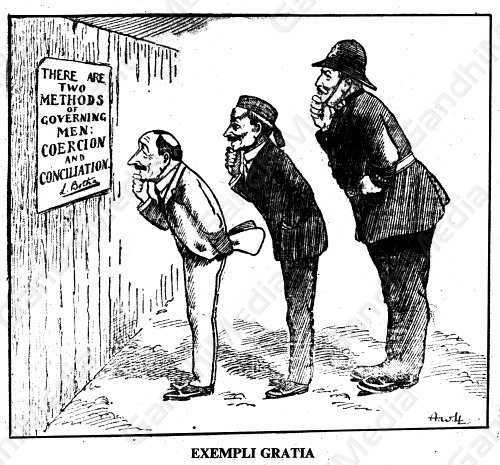 Exempli Gratia - General Botha in a letter to Sir Wilfrid Laurier, on the occasion of the Quebec Tercentenary, said that “There were two ways of governing men. Coercion and Conciliation.” - Cable item, 1909. General Botha decided that only a policy of toughness would pay. He unleashed a campaign of terror against the Satyagrahis in 1909. Arrests, imprisonment, deportations were the order of the day, but there was no let-up on the part of the Satyagrahis despite the inhuman treatment they were subjected to by the forerunners of apartheid.